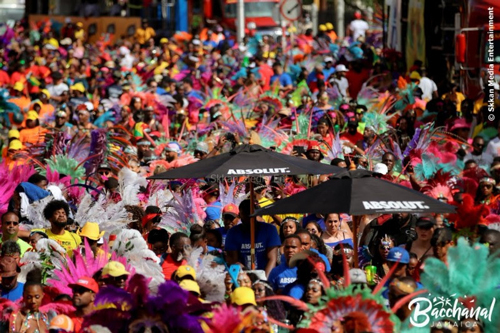 Liguanea was a hive of excitement on Sunday morning as costumed groups, individuals, music trucks and all parties involved in the Bacchanal Jamaica road march descended on the area. The vibes increased as friends linked up, the music revved up and the trucks rolled down Hope Road blasting the soca beat. Vibes masters Narity, Sanjay, Richie D, Kevin Crown, Miami Dream Team, Barrie Hype, Smoke, Back2basic, Private Ryan, Patrick the Hype Man, Tyler and King Taj kept the hyped reveler’s chipping, wining and jumping, going nonstop for the duration of the route, with an hour’s rest at the lunch stop at The Lime Golf Academy. The costumes with their intricate designs and fabulous feathered plumes created a spectacular array of colour as the band wended its way on the parade route. All the elements combined to make the day an excellent one. The weather allowed the parade to proceed in relative comfort. The rest stop at the Golf academy was well executed complete with makeup station, foot spa and shoulder massages, allowing revelers to truly refresh themselves and get ready for the next stage of the parade. All service providers outdid themselves in ensuring hospitality of the highest quality. The Frenchmen delivered on their promise of a premium experience. From the premium drinks and snacks on the road to an enhanced experience at the lunch stop, complete with a choice of cuisine and an upgraded bathroom set up. Costumed revelers were well and truly pampered. New fan, Jilliwerx, endorsed this view of Bacchanal Jamaica, “I was a Bacchanal newbie, however, a carnival feteran in Trinidad, NY, and Bermuda and I must say standards remained high throughout the experience. Thank you for your attention to your patrons! You have fostered more loyal fans! See you in 2019”. The glitz and glamour of the costumes, the energy of the revelers and the vibes of the music made the Bacchanal Jamaica Band unparalleled in the road parade on carnival Sunday and provided the perfect climax to an outstanding 2018 season. According to one fan “the experience was awesome. The high-energy, upbeat music kept us going. It was a truly fantastic, all-day fete. Everything was right – music, food and drink. This year Bacchanal was better than ever”. “We are ready for next year”, commented Charmaine Franklin, Bacchanal director, and we urge everyone to save the date, April 28, 2019, when we create another fantastic experience”.